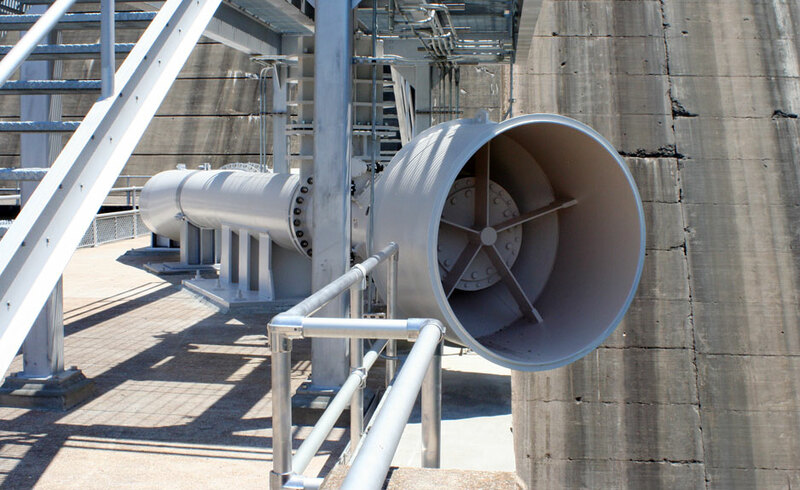 The American Society of Civil Engineers/Arkansas has given its 2012 Outstanding Engineering Design of the Year Award to Garver's Norfork Dam bulkhead and siphon project. 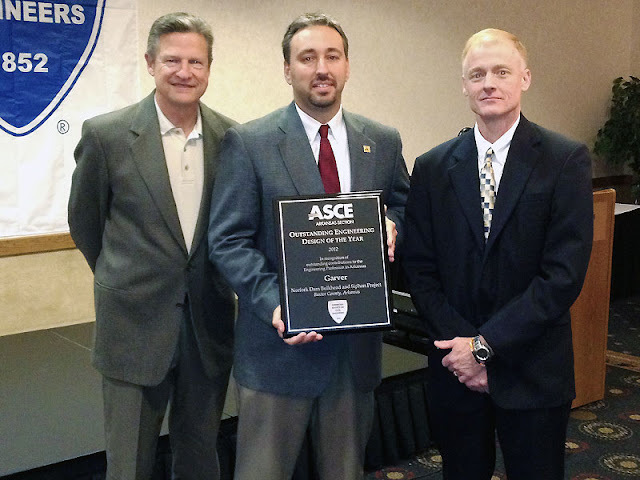 Accepting the ASCE/Arkansas design award for Garver is Terry Johnson (retired) and project leaders Paul Strickland and John Watkins. The two cutting-edge projects at Norfork Dam in Baxter County, Arkansas are meeting unique needs. A siphon through the dam improves North Fork and White rivers trout habitat by sending a constant flow of cooler water downstream, and a 65-ton steel bulkhead allows maintenance staff to easily seal and dewater the dam’s spillway gates. Steady Flow for Trout Below: The 42-inch-diameter siphon draws water from Norfork Lake, carries it through the dam and down the structure’s face, and discharges it into the North Fork River. This cooler minimum flow provides a more stable condition for the cold-water fish habitat, which contributes to the area’s world-class fishery. The nearly 5-mile-long tailwater to the White River is stocked with brown, rainbow, cutthroat and brook trout that struggle to survive and reproduce when water warms and pools. 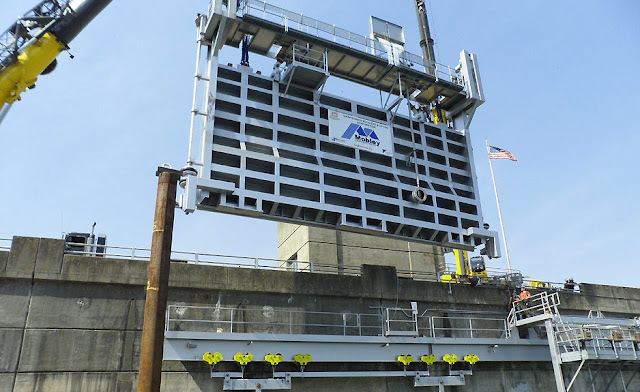 Rolling Bulkhead: The unique spillway closure system consists of a 130,000-pound maintenance bulkhead that runs along a 667-foot-long steel monorail beam attached to the dam. After motorized trolleys slide the 24-foot-high by 48-foot-wide bulkhead in front of a tainter gate bay, the spillway gate is opened. As the bay is dewatered, the resulting differential pressure pushes the bulkhead into the opening and holds it in place. 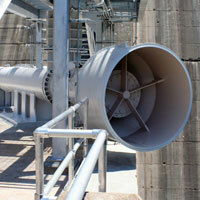 This allows maintenance crews to work on the gates and gate mechanisms in a dry condition. The bulkhead project was recently featured in our newsletter, IQ, and the siphon project will be featured in a future issue.